I’m looking forward to checking out the annual Festival of Lights in downtown Riverside. 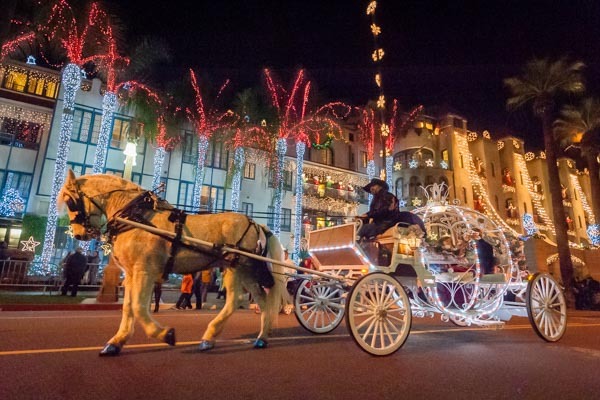 Every year, shortly after Labor Day, crews begin the monumental task of decorating The Mission Inn for the event, which begins with the lighting ceremony the day after Thanksgiving and ends around New Years Day. It’s pretty amazing to me that after gorging on turkey and all the trimmings yesterday, and shop ’til you drop today on Black Friday, folks still have the energy to gather downtown in the evening and watch the lights come on and the fireworks go off. It’s become one of my annual traditions, to take a thermos of hot chocolate with me and see the lights and revelers sometime during the holiday season. Hard to believe the place was slated to become a parking lot for government workers before Duane Roberts rescued it from the wrecking ball. The restoration of the Mission Inn saved downtown Riverside, making it the Inland Empire destination it is today. High school classmate and former neighbor Dorothy O’Donnell had this to say about a weekend visit during the Festival of Lights for the Los Angeles Times.